Rising temperatures and an abundance of fresh herbs and produce make summer the perfect time to experiment with mixology. As I was looking for recipes to share I found myself inspired by the fresh colors captured by these talented food bloggers. Below are some refreshing summer drink recipes alongside designer fabrics selections that will last much longer than the drinks. The Watermelon Gin and Tonic from A Cozy Kitchen looks so refreshing. Osbourne and Little's Balzac multi-colored stripe shares that same fresh, summery vibe. I’ve always thought of Chai as a wintery treat, but the addition of coconut and lemonade makes this drink perfect for summer. A mid-scale quatrefoil trellis features a soft yellow similar to the muddled hue of the drink. The flesh of blood oranges is what makes this summer drink a stunning hue. 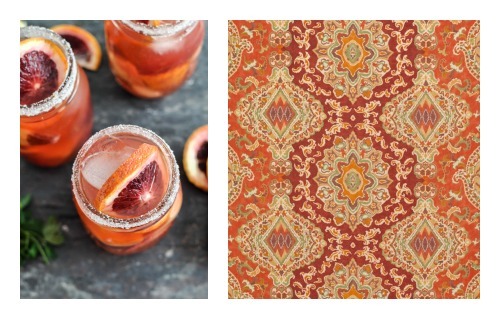 Berber, a large-scale paisley print, is just a vibrant as the sangria. A classic mojito is typically made with mint so I love that this recipe changes things up a bit by using basil. The pop of lime green in Osbourne & Little’s Pedrolino is balanced by two sophisticated neutrals and the wide width of the stripe makes the pattern feel modern. What’s your favorite summer drink? Share the recipe here!